This is the solution we have found to provide light, block onlookers, secure to stop twin toddlers from tearing them down, and removable to wash the sheers. The rods are cheap plastic (I don't care), basically invisible, secure firmly with screws at the top and bottom, yet they come off easy enough to clean the sheers when the toddlers get them sticky. I tried the adhesive panels; the toddlers tore them down. I tried the frosted spray; the toddlers chipped it off and tried to eat it (what a mess and the smell)! I tried the suggested magnetic rods; they weren't nearly strong enough. I tried a half dozen Pinterest solutions to no avail. I have zero time for things that don't work. FYI: To get the photo, we needed to order three panels of the Stylemaster Home Products Elegance Voile Side, 30-Inch by 72-Inch, Light Beige to match Sherwin Williams color Kilm Beige. Not the cheapest solution, as I needed three, but I don't have the time to sew my own right now, or think, or sleep, or really even to write this review. Works exactly as you would expect sash curtain rods would work. 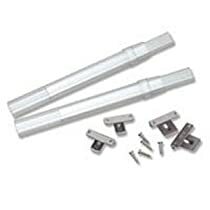 However, I did not use the screws that came with them, though, since my door frame is metal. Instead, I used 3M mounting tape which works great and doesn't harm the surface. I like to sew up seasonal touches for my home and that includes sidelight curtains for the front entry way. These are perfect for sidelights, but a little bit lightweight. I am using calico type fabrics with them successfully, but I doubt they would support anything heavy like velvet or even duck. best of all, they mount flush to the wall/surface, so no competition with swinging doors for open space. I am satisfied with them.